Breakfast was at home. I didn’t feel like eggs, and I didn’t feel like eating until around 10:30, so I tried a new recipe. Years ago, when I was a single mom (and still not much of a cook), I used to boil fettucini, then top with parmesan cheese and chopped garlic. I loved it. 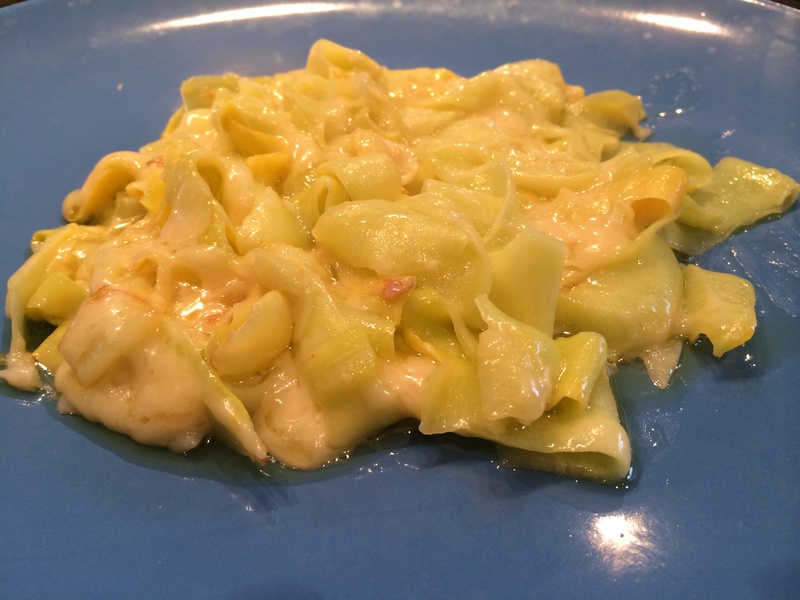 I decided to try it with yellow squash, shaved into keto fettucini noodles. Instead of parmesan, I used grated Dubliner cheese. It’s similar in flavor, but I don’t think it tasted as good as the real parmesan would have. It as a day for experimenting with new recipes. For lunch, I decided to try a hot dog recipe I saw recently on one of those Food Network challenges. 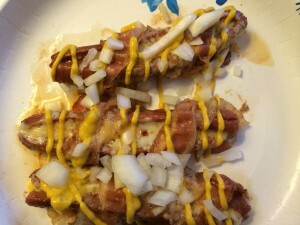 On the show, the contestant slit hot dogs, filled them with pepper jack cheese, wrapped them in bacon and deep fried them. I didn’t feel like getting the deep fryer out, so I did the same recipe with precooked bacon and put them in the microwave. There were only a mild success. The Hebrew National frank flavor completely overpowered the flavor of the bacon. I guess those precooked slices can’t hold up in the flavor department. The result was just okay. 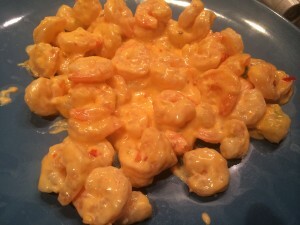 For dinner, I had a craving for some bang bang shrimp. I love this dish at Dave’s Fish Market, and I really enjoyed the similar version of the shrimp I had in a restaurant in Florida last month. When we discussed the dish with the waiter in Florida, he said that the sauce was a simple combo of mayo, sweet and hot thai sauce and hot sauce. I looked up the recipe for bang bang shrimp online and came up with my own keto version. 1 1/2 cups of mayo 1 tbsp Taste of … sweet/hot chili 1 tsp srirachi sauce I sautéed a pound of shrimp in 1 tsp of butter mixed with 1 tbsp olive oil for 4 minutes. When finished, I coated with the sauce and let it simmer about one minute.